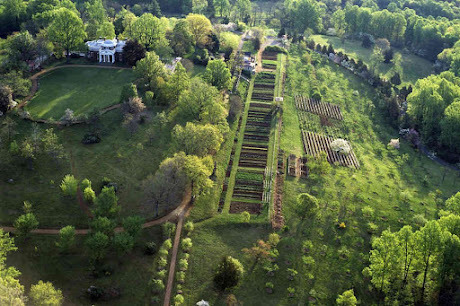 So did you know that Thomas Jefferson's vegetable garden at Monticello was one thousand feet long and contained more than 250 varieties of more than 75 species of plants from around the world? Carved into a terraced, slopping hilltop, and tended by elderly slaves, called “veteran aides,” Jefferson’s garden was divided into twenty-four rectangular squares, or growing plots, arranged according to which part of the plant was to be harvested, be it roots (carrots and beets), leaves (lettuce and cabbage) or fruits (tomatoes, peas, and beans). Among the many exotic new plants grown there were beans and salsify collected by the Lewis and Clark expedition, figs from France, peppers from Mexico, and broccoli and squash imported from Italy. As methodical as a botanist, Jefferson recorded the results of his planting experiments in his Garden Book, noting such events as the dates that seeds were planted, when leaves appeared, and when his favorite vegetables were ready to eat. Biographers say that Jefferson’s favorite vegetables included tomatoes, turnip greens, corn, and sweet potatoes. He was also particularly fond of the English pea, and, by staggering the time of their planting, he and his many dinner guests were able to enjoy them from mid-May through mid-July. Jefferson might have taken special note of the English pea because of an annual neighborhood contest to see which farmer could bring to table the first peas of spring. The winner would host the other contestants in a dinner that included the peas. Though Jefferson's mountaintop garden, with its southern exposure to warmth and light, should have provided an advantage for the contest, it seems that the contest was almost always won by a neighbor named George Divers. As Jefferson's grandson recalled: "A wealthy neighbor [Divers], without children, and fond of horticulture, generally triumphed. Mr. Jefferson, on one occasion had them first, and when his family reminded him that it was his right to invite the company, he replied, 'No, say nothing about it, it will be more agreeable to our friend to think that he never fails.'" Sauté the spring onion in two tablespoons olive oil over medium-high heat. 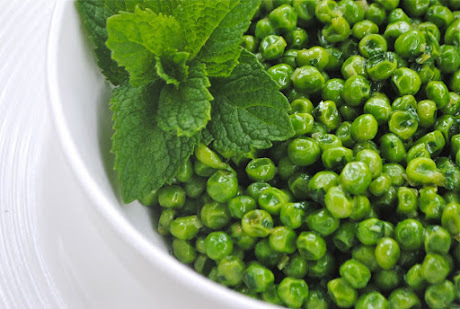 Add the shelled peas, a pinch of salt, and enough water to barely cover. Cook over high heat for 2 minutes, then add the torn mint leaves. Continue cooking until the peas are tender, a few more minutes. FOOD FACT: When English colonists arrived in America, "pease" were one of the first crops to be planted. This makes sense because peas are nutritious and easy to preserve and ship. They also keep for long periods of time, as reflected in the old children's rhyming song, "Pease Porridge Hot." Maybe you remember the lyrics: Pease porridge hot/Pease porridge cold/Pease porridge in the pot/Nine days old! For my submission guidelines at Publishers Marketplace, click here!